I thought it might be funny to have an opposition party for the VOTE SUMP Project. As a result, a couple days after people get used to seeing SUMP around town I'm going to introduce anti-sump yard signs and flyers. 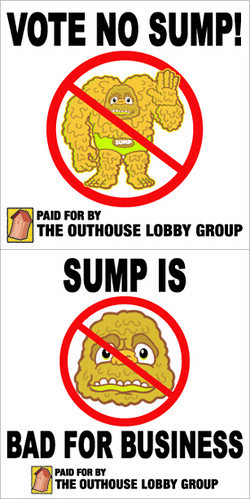 The ficticious party running against SUMP will be The Outhouse Lobby Group. Having an opposition party sort of takes the concept to another absurd level.